What a fantastic day out on the trails! Temp's in the 60's and a fun group of people. O.T.R.A. (Oklahoma Trail Running Association) ran at Clear Bay this morning. I got in almost 10.5 miles and got to spend it with friends..what a great Saturday morning. Then we all headed to town for lunch at Panera. 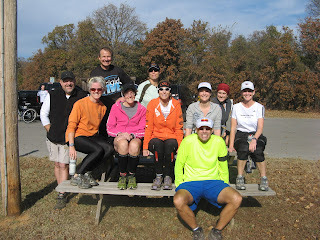 What did I ever do before I had my fun group of friends to trail run with?? Love these people! How fun!!! Looks like a beautiful OK day! !